What is this culinary mashup? Read on to find out. 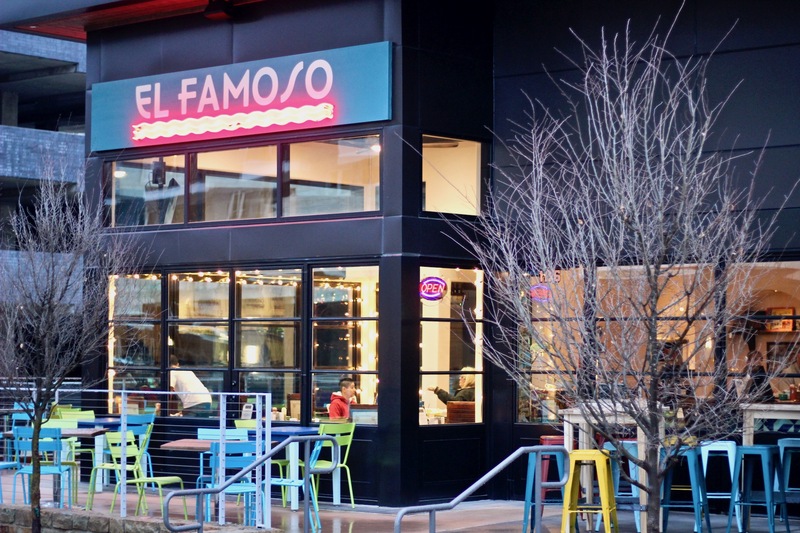 El Famoso recently opened in the growing Gables Water Street development in Irving. The restaurant is brought to us by Charlie Green, the man who also introduced Dallas to Olivella’s Neo Pizza Napoletana. This new spot bills itself as “California-Tex-Mex”, something I, for one, am not particularly familiar with. So I bravely set out to get a taste of what this mash of cultures would translate to. The restaurant itself is small, clean, brightly colored, and cheerful. A large patio offers a substantial number of seats for outdoor dining, and a small, well-stocked bar offers a place for those wanting to spend their meal there. We took our table, the place was not particularly crowded, and our service was attentive and helpful. Chips arrived quickly, hot and crisp, accompanied by two salsas already sitting at the table. We glanced over the menu as the waiter gave us his overview of what we should consider eating. It didn’t take long to realize this was not standard Tex-Mex fare. The most interesting points come from items reminiscent of the standard American greasy spoon diner, but each given a vaguely Mexican upgrade. Many of these fall into the section of the menu called “Para El Gringo.” Take Lupita’s Mac & Cheese, a spicy pasta with chilis and cheese topped with carne asada and crispy tortilla chips. Or the Sloppy José sandwich with chipotle-marinated ground beef and grilled onions. There’s a cheeseburger topped with roasted poblanos and queso, and the related, Filly QuesoSteak with sliced sirloin, onions, poblanos and queso. There’s a smattering of “Tex-Mexicali” tacos with fillings such as Mexican meatballs, spicy barbecue brisket, and fried chicken. The most well-advertised dish on the menu is the hefty 14-inch El Monstro burrito. For $18 you get a flour tortilla filled with ground beef, brisket, carnitas, cheese, rice, beans, guacamole, and smothered in queso. Suffice it to say, it’s a big menu, with some original dishes, but if you’re looking for the traditional Mexican or Tex-Mex plates, you’ll find those, too. I enjoyed my queso-smothered burrito. I did not have the stomach space for the aforementioned Monstro, and so settled on the more reasonably-sized 8-inch option. I opted to fill it with the ground beef, as it seemed to appear all over the menu. It was satisfying and I wasted no time scraping every bite off the plate. We did an assortment of street tacos: picadillo, chorizo, and pastor. These rather spartan options were plain, double-tortilla and meat-only, and were successful to varying degrees, but the meats were a bit dry and none were particularly memorable. I can endorse the chile relleno, though. 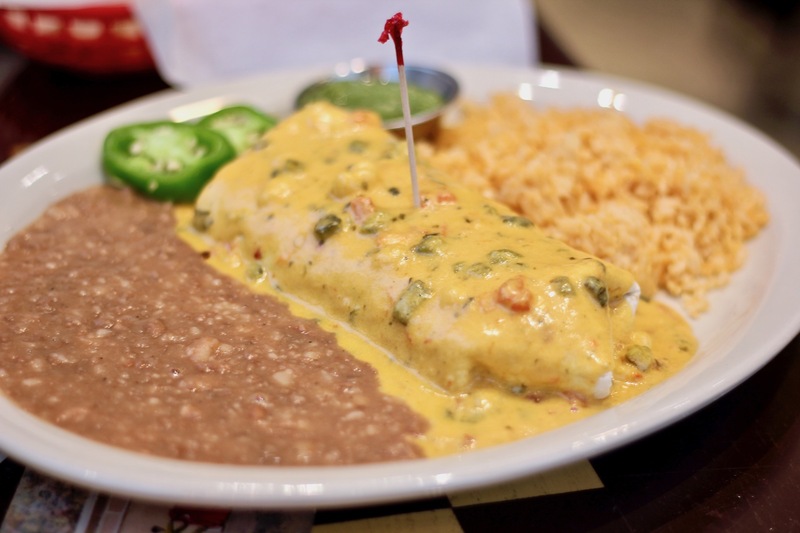 This large poblano pepper is stuffed with jack cheese, lightly fried and smothered in garlic cream sauce. Maybe it isn’t necessary to fully understand a restaurant’s culinary directive to enjoy the food it offers. El Famoso is certainly aiming for some form of Mexican-American cooking, a form that’s apparently vanishing from our modern foodscape, or was it ever here to begin with? We’ll just have to see if El Famoso can convince us that it’s something worthwhile.